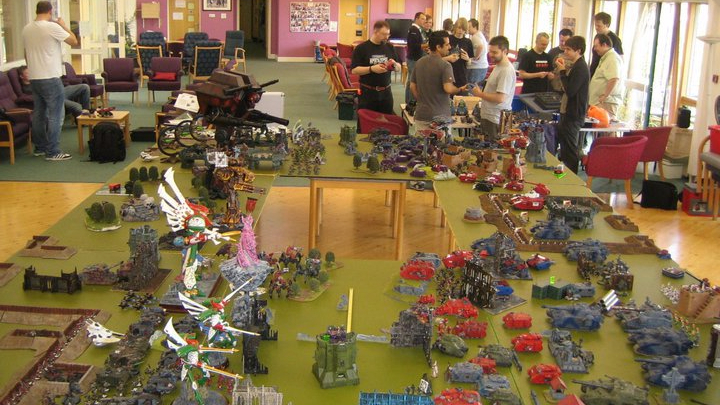 Guildford Games Club is a group of individuals who meet weekly to primarily participate in miniature war-gaming. Every Monday from 19:30 until 23:00. At the Park Barn Centre, Park Barn Drive, Guildford, Surrey, GU2 8EN. The main entrance is usually locked and you will need to gain access by following the path around the left hand side of the building. No, membership as such is not required. You will need to agree to follow the Club Rules and any rules laid down by the Park Barn Centre. Your first visit is free, and thereafter there is a charge of £3.00 per meeting. If you come to play a game and are unable to, due to a lack of opponents perhaps, then your charge will be refunded. This doesn’t apply if you have come to to socialise, paint or participate in any other activity. Younger gamers might be allowed, but only if accompanied at all times by a responsible adult. Please discuss this with the Club Chairman. There is no specific restriction on what games can be played at the club, but it is subject to common sense. Games played include: Kings of War, Necromunda/Shadow War Armageddon, Epic Armageddon, Infinity, Age of Sigmar, Warhammer 40,000, Frostgrave, SAGA. The hall we hire at the Park Barn Centre has space to fit about ten 6′ by 4′ gaming boards comfortably and a large seating area generally used for board games, card games and role-playing. In the past we have set up twenty gaming boards for tournaments and the like but its a bit of a squeeze. The Park Barn Centre also provides us with storage space for gaming boards and scenery. As the Park Barn Centre is a day centre for the elderly it naturally has excellent disabled facilities. You can’t smoke or drink alcohol or participate in any activity that would spoil the enjoyment or endanger the safety of someone else.